Adobe MAX ended last week at the Los Angeles Convention Center and what an amazing event it was! Thank you all for visiting NVIDIA’s booth to learn more about NVIDIA RTX products and solutions. 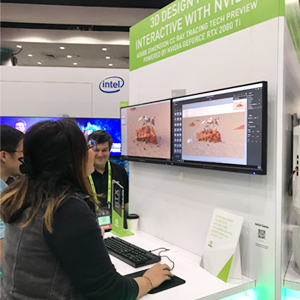 This year at Adobe MAX, NVIDIA and PNY highlighted their RTX™ (Turing architecture) graphics boards - the most significant advance in computer graphics in over a decade for professional creative and M&E workflows. Booth #717 featured some very exciting demos! PNY’s PREVAILPRO was also featured at Adobe MAX. This professional-grade mobile workstation is a perfect solution for Adobe CC users. Certified by Adobe and equipped with an NVIDIA Quadro P4000 or P3000 GPU, PREVAILPRO enables you to render images, 3D models and video’s faster than ever before with a mobile solution. At NVIDIA’s Creative Experts Bar, some of the top design professionals in the industry displayed their talents and provided insight into their Adobe workflows. These pros covered everything from VFX and 360 VR video production in Adobe Premiere to photo editing in Photoshop and Lightroom. These Adobe application demos brought a lot of eager digital content creators to the booth! Perhaps the most popular attraction at the booth was NVIDIA’s “Paint your next Van Gogh” with an AI assisted Sketch demo. Powered by the GeForce RTX 2080, attendee drawings and sketches were turned into beautiful works of art by a DNN trained with Van Goghs distinctive style of painting. With the help of a Wacom tablet and the GeForce RTX 2080, the DNN was able to Transform sketches or drawings into convincing Van Gogh-like works of art. Using the NVIDIA Quadro RTX 6000, NVIDIA showed 8K RED footage being edited in REDCINE x PRO. NVIDIA compared GPU rendering to CPU rendering and the Quadro RTX 6000 was the clear winner. Without dropping any frames during playback, 8K footage was edited at full resolution and frame rates with the Quadro RTX 6000. Created by Epic Games, Porsche’s 70th anniversary video “The Speed of Light” demo was on display at Adobe MAX. Show goers were able to interact and manipulate a Porsche 911 Speedster concept using NVIDIA’s photorealistic interactive ray tracing technology however they wanted. Thank you all for stopping by the booth and we look forward to seeing you at the next Adobe MAX!